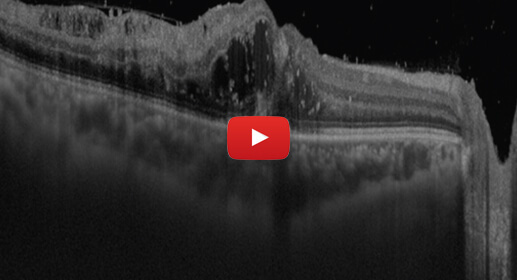 Cystoid macular oedema is a painless disorder which affects macula (central part of retina). This condition is due to accumulation of multiple areas of fluid as cysts in the macular area. 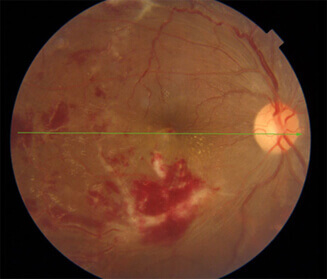 Fundus picture and OCT of a patient with cystoid macular oedema due to branch retinal vein occlusion. A variety of diseases are affected with this condition including retinal vein occlusion, uveitis (inflammation of the middle coats of the eye), and diabetes or after cataract surgery. Dilated Fundus examination: Edema or elevation of the macular area is seen on dilated Fundus examination. Treatment: The factor causing the macular edema should be treated. Usually topical NSAIDS are the first line of management in CME. Systemic carbonic anhydrase inhibitors may be added to this. However, if inadequate response is noted posterior subtenon triamicinolone may be considered and in resistant cases Intravitreal triamicinolone/ Ozurdex implant injection may be considered. If the cause is due to vitreous pull Vitrectomy is done to remove the insult.